Please meet me at the door. This is my new mantra every time I drive towards my house. I repeat it. I beg. I cry. I park the car holding my breath and I walk in the door full of wishes and promises to do anything to have Brody meet me at the top of the stairs. I have heard that knowing your dog is sick matters less about their food consumption, less about their energy level and more on that one moment when you come home – are they greeting you at the front door? It has been about two weeks and only once or twice (yesterday was one of them) have my prayers been answered and there has been a wiggly nub waiting for me as I walk through the doorway. Brody is hurt and we can’t find the pain. We have had x-rays, we have had blood work, we have had an ultrasound, we have tested for lyme and he passes every medical test. It isn’t the cancer, it isn’t the solo hind leg, it isn’t an infection and it isn’t lyme. I am out of money – let’s face it… I am beyond the point of out of money. We have him on 3 pain killers and have him on the oral chemo. He eats, drinks and goes to the bathroom just fine but he hurts and I hurt too. I haven’t slept in my bed with my wonderful husband in about two weeks. I sleep on the schedule of a new mother – I sleep when my baby sleeps and that is a sporadic schedule. We have more appointments that I cannot afford next week. Until then I keep him comfortable, we snuggle, I operate day to day on autopilot and I hope, pray, and make deals with higher powers for some sign of recovery. I have invested most of my wishes on that wiggly nub at the top of the stairs, greeting me at the door when I come home – that will be my sign. Amanda, my heart is breaking for you. Hopefully you have some wonderful moments mixed in with all of this. Much love and energy. Thanks Rachel. We have. We have had lots of cuddles and laughs during these last few weeks. He still has his personality and he has always been a funny little man. I know you understand this breaking heart. Thank you for your support and good vibes. Amanda, I am chanting (our Buddhist prayer) for the best possible outcome for you and Brody. Sending you support. I wish there was something I could say to make the 3 of you feel better, Amanda- but I know there isn’t. Just know that Kathy & I very much understand and feel for what you’re going through. Truly. Thank you Aaron and Kathy. you are a good mama. Hoping the best for you all, transitions are so complex. Thanks Heather. Complex is a good word. You guys are in my thoughts and I hope that Brody feels better very soon! Amanda, you, Brody and Adam are in our thoughts and prayers. Thinking of you and praying for a healthy wiggled welcome home. Hi Amanda and Adam, Rob shared this post with me. I read it (and several more!) with such a mix of emotions–the heartbreak of the awful kind of empathy that comes from having lived through an experience like this, but also the sweet sorrow of remembering some amazing dogs. I grew up with Peaks-Island-going Rottweilers and a Rottie-mix and Brody’s stories brought back many happy memories. Thank you, Brody! Unfortunately, two of our boys also had osteosarcoma and become “tripawds” like Brody when we understood from them that they still had some living to do! It’s amazing how they communicate when it’s time to go. Thank you for sharing your beautiful posts and adorable pictures of Brody. And thank you for posting about Everest when we were searching for him. 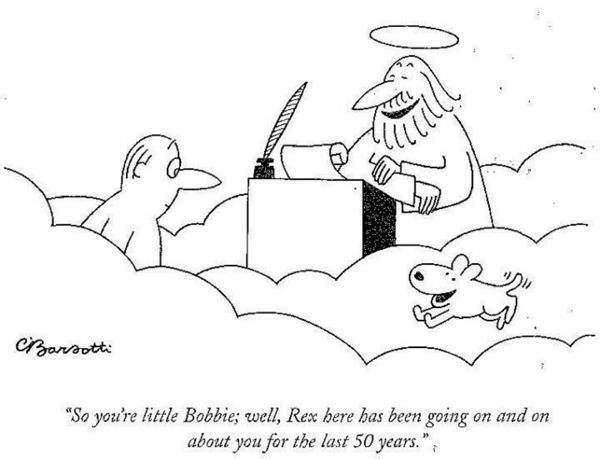 One of the best thing about dogs is that they’re never really gone. Everest died in August, but he’s still with me every day. Your bond with Brody will always be a part of you, and I think the fact that you were open enough to have had that kind of love with another species says a lot about what kind of human you are. Thank you Chelsea. I loved that comic. Going to keep that one nearby for awhile. I also liked how you said they communicate when they have more living to do. When Brody broke his leg in April, there was no doubt in my mind that he had more living to do. We got another amazing 10 months with him and he lived the crap out of each ‘extra’ day he was given. I am heart broken but one thing I am so happy that I have is the confidence that I did EVERYTHING I could for my man and there is no doubt that this week was the right time. He was ready and I was as ready as I guess I could be. This, just as you were saying, is a heartbreak that will probably never fully heal. I appreciate yours’ and everyone’s wonderful words and thoughts. Thank you! I accidentally found your blog while looking for movies to watch while sad/sick. I had to put my best friend, Eddie, my cat, down yesterday. It was probably the saddest day of my life. So it was horrible timing to wander the internet. Though going through your blog, it gives me hope seeing that you’ve gotten a new furry friend, to help with that awful hole in your heart that losing a pet makes. I’m sorry that you lost your best friend. But happy to see that it can be eased. I am so, so sorry to hear about the loss of your friend. I hope your pain gets easier. Our pets have a very special spot in our lives. Getting another furry friend, for me, was the right decision but it isn’t for everyone. I still can’t talk about Brody or look at these posts without turning into a puddle. I miss him so much. One person told me, and so far it seems to be true, that the pain doesn’t go away but you get better at dealing with it. I am happy to have reminders of Brody everyday. Take time to heal the way you need to, don’t listen to anyone else. Good luck and take care! Previous PostPrevious Super Bowl Alternative – PUPPIES!